So far we’ve seen that God has given us faith to enter through the fence of the tabernacle courtyard into His glorious kingdom. We’ve found forgiveness through God’s own Son offered on the Bronze Altar. We’ve taken a good look at ourselves in the Bronze Basin and committed to a new life with God. And now we want more. 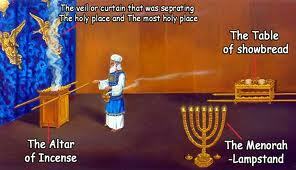 The gift God offers at the menorah is a – transformed mind one that’s illuminated with a spiritual perspective. He offers to put His own Spirit within us. This is really like a seven-fold gift He has for us in order to draw us closer to Himself and allow us to live in intimacy with Him. These seven spirits within us change our whole perspective. In our previous analogy of the father inviting the son home, this would be like the son coming to his father’s home and finding it set high upon a mountain with a 360˚ view of everything below. Everything looks completely different — he can see the bigger picture. The things he was doing and was concerned with before look minute, and he can now see how things really work and what things are most important. With the gift of the Holy Spirit, we can now comprehend the spiritual nature of things. We can see what’s happening behind the physical circumstances – behind the veil — and we can be led by His spirit in our actions, words and understanding. With the Holy Spirit, God is equipping us to participate with Him in His business — in bringing about His will and plan for ourselves, and for mankind – now and into eternity. But, there’s more! Our new perspective changes our motivations and desires. We now need the gift awaiting us at the Table of Showbread. We’ll start there in Part 6. This entry was posted on July 13, 2012 by Administrator. It was filed under Holy Spirit, Tabernacle and was tagged with Ephesians 1, Exodus 25, exodus 26, Exodus 27, Gifts, Holy Place, Inside the tabernacle, Isaiah 11, Lampstand, Menorah, Messianic, Mishkan, Rom 12, Ruach HaKodesh, seven spirits, spiritual perspective, tent of meeting, veil.